Corrosion coupons are put in contact with the cooling water and remain for a period of time such as 30, 60 or 90 days. They then are removed and evaluated as to their metal loss. Is your cooling water system effectively protected against corrosion? Are you or your supplier measuring corrosion rates regularly? Are you testing all the metals being contacted by the cooling water? Do you know what protection you want? Do you know what the corrosion rate standards are for your cooling system metals? Do you know how to examine your metal piping, condenser tubes and cooling tower to identify corrosion? How long should your equipment last before it needs replacing? These are some of the common questions end users and owners often ask. However, often they are asked after equipment replacement has occurred or about to be due to corrosion. Figure 2. These copper and mild steel coupons show excellent protection after 90 days of exposure. Know what metals are contacted by the cooling water in your system. Fill in this list or develop your own. If you do not know the exact metal, go to your supplier or contractor to get the specifications. An example is provided in table 1. Now you have identified all of the metals within your cooling system. Figure 3. The presence of concentric rings often indicates the corrosion is due to sulfate-reducing bacteria. Table 1. An important first step in determining your water treatment plan is to identify all of the metals within your cooling system. If more than one metal is present in a system component, be sure to list them all. Specialized corrosion testing is available if certain cooling water-contacted equipment has had premature failure or excessive corrosion. These may be pump impellers, valves or some process equipment. 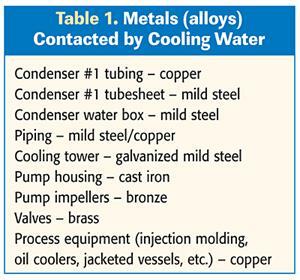 Thus, in cooling water systems, the following metals are (or should be) tested: mild steel, copper/copper alloys, galvanized steel and stainless steel. Figure 4. 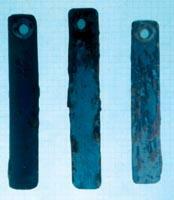 These mild steel corrosion coupons show the water treatment program is providing poor protection. Always wear gloves and avoid any touching of coupons with bare hands. Install coupons in order of nobility (from least noble to most noble) in the direction of flow. The most common coupons are in bold. Corrosion coupons are small inexpensive strips of the metal to be tested, are put in contact with the cooling water. These remain for a period of time such as 30, 60 or 90 days and then are removed and evaluated as to their metal loss. Coupons often are 0.5 x 3″ and 0.0625″ thick. They can be larger, or even as 0.5″ rods, and there are various configurations (figure 1). A calculation is made to determine the annual average corrosion rate occurring. This measurement is most often reported as the average mils per year metal loss over the entire coupon metal surface. A mil is one thousandth of an inch. Thus, 10 mils per year (mpy) is a hundredth of an inch. It should be noted that copper condenser tubes often are about 20 mils in thickness and thus would be totally corroded at 10 mpy within two years. Mild steel, schedule 40 pipe, on the other hand, is about 120 mils thick and would be totally corroded in 12 years at the 10 mpy rate. Corrosion coupons are not only valuable in determining the average corrosion rate but, upon their close inspection after cleaning, can reveal localized and/or pitting corrosion. This selective corrosion can be 10 to 50 times greater than the calculated average corrosion rate. Thus, penetration can occur much more rapidly and leaks may occur in a year or less. Examples of mild steel corrosion coupons both before cleaning and after can reveal the presence of localized or pitting corrosion (figure 2). The characteristic localized and/or pitting corrosion on mild steel coupons might also reveal the cause of the corrosion. The presence of “concentric rings” often indicates the corrosion is due to sulfate-reducing bacteria. This is shown in the figure 3. Tables 2 and 3. Use these guidelines to determine how corrosion rates are assessed vs. the desirable values for cooling tower systems. Table 2 shows cooling tower systems while Table 3 shows closed cooling systems. Guidelines and industry standards are published for the desirable corrosion rates of different metals. When maintained, equipment life is very acceptable. To determine how corrosion rates are assessed vs. the desirable values, the following tables provide these guidelines. Table 2 shows cooling tower systems while Table 3 shows closed cooling systems. For more information on monitoring corrosion rates in your systems, leave us a comment or give us a call at (800) 839-1000.